The Amish Bellagio Barstool with Swivel is a classic design inspired from traditional dining furniture found in the countryside of Italy. 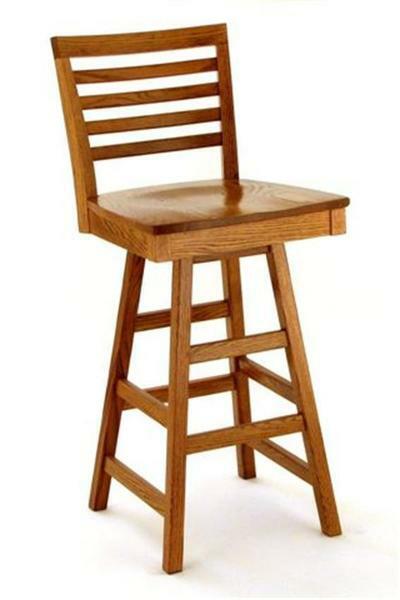 Our Amish Barstools are handcrafted in America from 100% solid hardwoods. Our Amish Bellagio Barstool with Swivel features five wood choices, two seat heights and fabric or leather seats. Customize this elegant Barstool to suit your décor. If you are looking for a similar style without the swivel check out our Bellagio Bar Stool. The Bellagio stands strong, displaying a clean outline and a stand out profile. These Amish made bar stools embrace a contemporary kitchen with ease and adapt readily to changes in furniture styles. Enjoy our entertaining blog post, Cheers to the Perfect Home Bar Space, that offers a printable checklist of home bar essentials. Each solid wood bar stool we make is carefully scooped, shaped, and sanded to provide you with ideal seating comfort. Share a drink, snack or meal seated comfortably in these stylish custom made bar stools. Please call 1-866-272-6773 to speak to one of our Amish Furniture specialists with questions or for assistance when placing your order. I just wanted to thank you both for your help and advice since the dining room table and chairs just arrived safely. If you get an opportunity please send our thanks to the people who made them. Impressive craftsmanship indeed. A delightful mix of practicality, elegance, along with hints of both traditional and contemporary style. So well made. We hope to enjoy sitting at this table for decades, let alone years.